As an Occupational Therapist, I've had many years of warm-up exercises at the beginning of treatment sessions. Whether I was working with a child on fine motor skills or an adult with a shoulder injury, each and every session had a warm-up of some type. 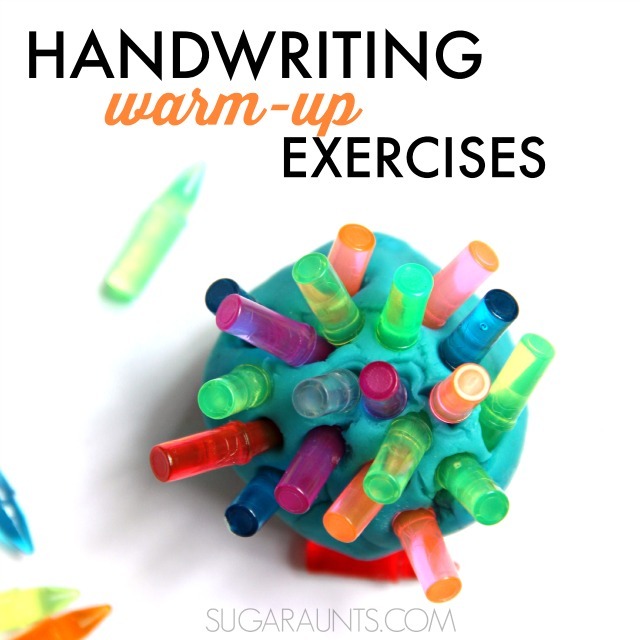 Today, I'm sharing a little bit about handwriting warm-up exercises. These are activities that will be fun for your kiddo and not seem so much like exercises, which in fact, WILL be exercises! 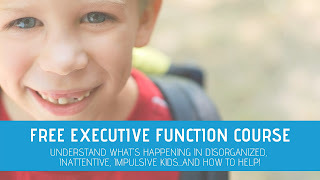 These activities are fun and creative ways to "wake up" the muscles, let the child's body know they are ready for handwriting tasks, and get little muscles of the hands ready for small motor movements and dexterity needed in handwriting. The Proprioception system sometimes needs a warm up before getting busy on a task like handwriting that requires precision and small motor movements and appropriate pressure on the pencil. 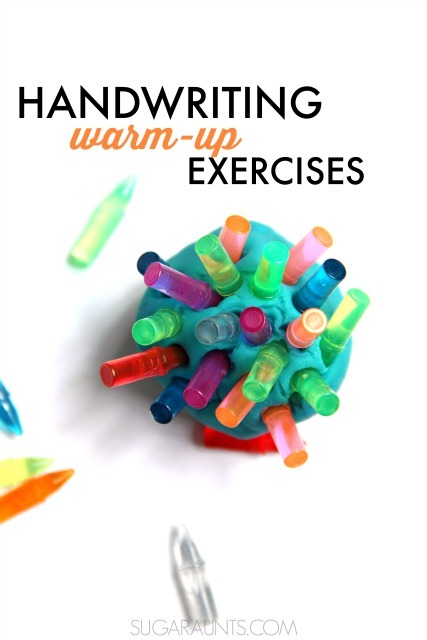 Are you ready for some fine motor warm-ups? Get ready to have some fun, because these aren't your typical sweat-inducing exercises! This post contains affiliate links for products that we used. 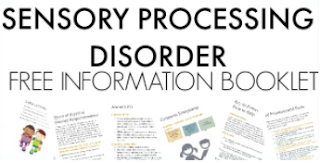 It is part of our 31 Days of Occupational Therapy series where I am sharing tips and tools using treatment materials that you can find in your home. The items we are using today in this activity are ones that we already had. I've got some alternative ideas, but also have the links to materials in case you are interested. 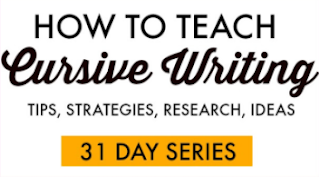 You might have seen our post on Proprioception and handwriting where I told you about helping kids who press too hard when they write. I shared more info about the Proprioceptive system here. 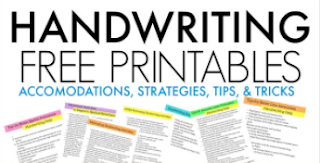 Based on this information, we know that kids sometimes need an oppourtunity to modulate the pressure needed to hold the pencil and write letters in a given space. Other times, children need to warm up their muscles much like a runner stretches their legs against a wall before heading out for a jog. While it's not likely that your kiddo is going to strain an intrinsic muscle while copying a sentence, they might complain of hand fatigue. Writing can be a difficult thing for many children and waking up those muslces of the hands is smart to do in a fun and relaxed way. Lit Brite Pegs and a ball of play dough. While these pegs are something we had at home, you might not have them available. Other items you could use in this exercise are toothpicks, cut cotton swabs, cut lollipop sticks, or any small peg. 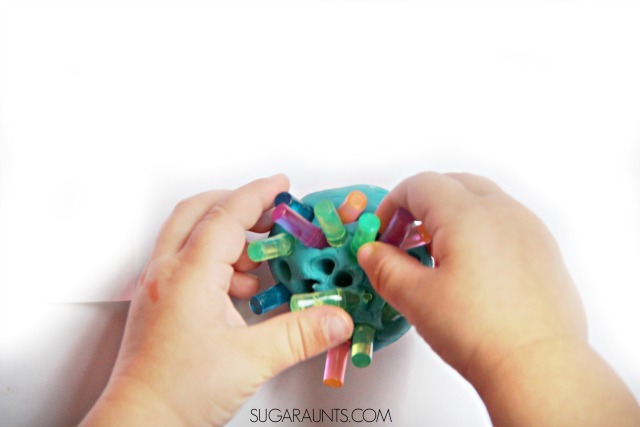 Start by asking your child to grab a handful of pegs from the table surface. They will need to work on in-hand manipulation to move the pegs from their hand into the fingertips. They can then place as many pegs into the play dough as possible. You will want the pegs to be small like our Lit Bright pegs for maximal intrinsic muscle work. 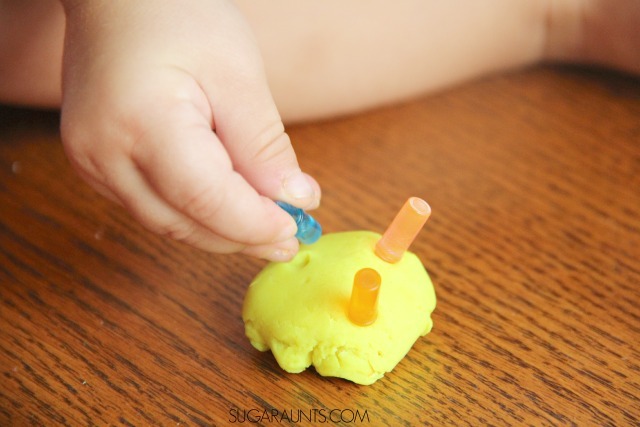 The resistance of the play dough provides feedback for the proprioception system and makes this a great warm-up activity. Once the child has pushed all of the pegs into the play dough, ask them to stretch their fingers out by spreading them as far apart as they can. Finger push-ups- Show your child how to spread their fingers far apart. They can press their fingertips onto the table surface and push down. Then, ask them to raise their hands and arms height above their head to stretch the whole upper body. Roll play dough into small balls. Roll the play dough into snakes. 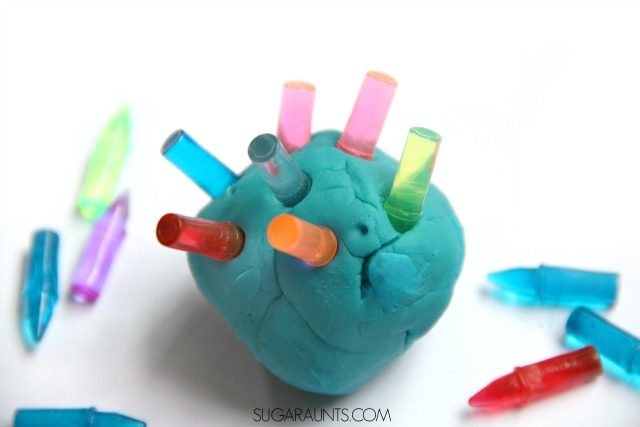 Press a pencil into the snake and cut on the lines with scissors so you end up with small pieces of play dough. Squeeze Stress balls. You can also squeeze a rubber ball for a free or almost free option. Hand squeezes: squeeze hands into a fist and then stretch out the fingers and wrists. Play with Finger Puppets . Make your own! Use our free printable to make farm themed puppets. Simply tape them into a loop shape and slide onto the fingers. Wall push-ups: Place both hands on a wall and push away from the wall. This is a standing activity and engages the whole arm in a pre-handwriting exercise. Play Pick Up Sticks . Make your own using dyed lollipop sticks. Stick very small small stickers going down the length of a pencil. Ask your child to start at the eraser end and work their fingers down the pencil so they pinch each of the stickers. Jacks is a great warm-up activity for little hands. Play string games like Cat's Cradle.